M-m-m Good! There is nothing like a warm bowl of soup on a cold winter's day. In pressure cooker on Brown, place ground turkey or lean ground beef with olive oil. Cook until meat is done, then add chopped vegetables. Saute briefly, add grain and broth, salt and pepper. Place lid on pressure cooker and cook for 3 minutes. Let pressure down. Open and thicken with Ultra Gel. Saute onion in butter. Add vegetables, water, bouillon, salt, and pepper. Reduce heat, cover, and simmer 20 minutes. Combine flour and milk until smooth; stir into pan. Bring to a boil; stir for 2 minutes. Add cheese just before serving. Pour the canned beans, along with the liquid, into a medium saucepan. Add the remaining soup ingredients and mix. Bring the soup to a boil, then reduce the heat to low and simmer, covered, for about 1 hour, adding water if necessary or until it's as thick as you like. Serve each bowl of soup with a garnish of red onion, jalapeno slices and sour cream arranged carefully in the center of soup. Saute chicken, onion, and garlic powder in oil. Add beans, broth, chilies, and seasonings. Bring to a boil then reduce heat and simmer uncovered for 30 minutes. Remove from heat. Stir in whipping cream and sour cream. Garnish with cheese, olives and chips. Put all ingredients in a large pot and mix. Bring to a boil, then lower heat and simmer for 20 minutes or so. Enjoy! Serve topped with topping such as shredded cheese, sour cream, and tortilla chips. In a crockpot, combine broth and peas. Add carrots, onions, celery, ham hock, marjoram or thyme, and bay leaf. Cook on low setting for 8 to 10 hours. Remove and discard bay leaf before serving. Makes 4 main-dish servings. This recipe is for a 2-quart crockpot. Brown ground beef in skillet; drain off fat. Place in crockpot. Add onion, green and red peppers, and celery diced tomatoes, tomato sauce, water, beans, green chiles, chili powder, cumin, salt, sugar, and pepper. Cook on low for 8-10 hours. Makes about 5 quarts. Leftovers can be frozen and kept for months. * Note: To use dried beans: Bring a large saucepan of water to boil. Add ½ pound each kidney and pinto beans and simmer for 30 minutes. Turn off heat, cover and soak for 90 minutes. Drain and add to crockpot. Cook on low for 10 hours or until the beans are soft. Add bacon pieces to a pot or dutch oven over medium heat. Cook for a couple of minutes. Throw in diced onion and stir, cooking the onion for 3 to 4 minutes. Add butter and melt. Add corn. Stir and cook for one minute. Add chiles and stir. Pour in chicken broth and cream. Add salt. Stir and bring to a boil. Reduce heat to low. Combine cornmeal (or masa) with water. Stir to combine, then pour into the chowder. Cover and cook for 15 minutes over low heat. If chowder needs more thickening, add another tablespoon of cornmeal mixed with water and cook for another ten minutes. Serve with crusty sourdough bread. Heat oil in a Dutch oven over medium-high heat. Add leeks and cook, stirring often, until soft, about 3 minutes. Stir in sage and continue cooking until aromatic, about 30 seconds. Stir in broth and water, increase heat to high, cover and bring to a boil. Add chicken and beans and cook, uncovered, stirring occasionally, until heated through, about 3 minutes. Serve hot. For fresh onion, heat oil in a large saucepan over high heat. Add onion and sauté until softened, but not brown. Add corn, green beans, carrots, beans, tomatoes, tomato sauce, chilies, water, bouillon, cilantro, chili powder, cumin, and garlic powder. Mince the corn tortillas into small pieces with a sharp knife, then add them to the soup. Bring to a boil, then reduce to simmer for 45 -60 minutes, or until the soup has thickened and tortilla pieces have mostly dissolved. For thinner soup, add more water. To serve, ladle 1½ cups into a bowl. Sprinkle a tablespoon of the grated cheddar-jack cheese blend over the top of the soup, and then a heaping tablespoon of crumbled corn tortilla chips over the cheese. Makes 6 servings. 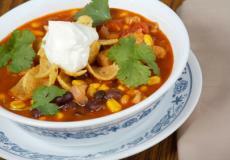 For milder soup, use tomato sauce rather than enchilada sauce and be careful about the amount of chili powder you use. I like it very spicy, but Marlowe not so spicy so I use tomato sauce with 2 Tbsp enchilada sauce mix and easy on the chili powder. Experiment with the seasoning until it is where you like it. In a large saucepan, sauté onion, mushrooms, carrots and celery in butter until tender; remove with slotted spoon and set aside. In a bowl, whisk flour and broth until smooth; add to pan. Bring to a boil; cook and stir 1 to 2 minutes or until thickened. Add roast beef, barley, garlic powder, paprika, salt, pepper, hot pepper sauce and onion mixture; cook and stir until heated through. Garnish with cheese if desired. Yield 8 cups. Soak beans in cold water to cover overnight. Drain beans and transfer to kettle. Add ham and enough cold water to cover by 1". Bring to a boil and simmer for 45 - 60 minutes, until almost tender. Add green beans, celery, leek, onion and potato. Add more water to cover, if necessary, and cook for 15 - 20 minutes, until almost tender. In a skillet melt butter, stir in flour, and cook, stirring, until browned. Remove pan from heat and stir in broth. Return pan to heat and cook until smooth. Stir into soup and simmer until thickened and vegetables are tender. Add more stock if a thinner soup is desired. Season with salt and pepper to taste. Shortcut: Substitute 2 cans Great Northern Beans, rinsed and drained, and 2 cups water. Skip soaking step and begin with beans, ham, green beans, celery, leek, onion and potato. Cook beef in large pan, drain. Stir in remaining ingredients except Parmesan cheese. Bring to boil, then reduce heat and simmer 12 minutes or until pasta and barley are tender. Serve topped with Parmesan cheese. 6 servings. In a pot, heat water; add bouillon, carrots, onions, celery, garlic, corn, and parsley. Simmer, covered 15 minutes. Add pasta and simmer 10 minutes more. Stir in chicken. Heat through. Season to taste and serve. Serves 4-5. Place all ingredients in a large kettle and simmer 40 minutes or until vegetables are tender. Add more water if needed. Season to taste. NOTE: May add some cooked ground beef or diced roast beef. Heat oil in a large saucepan over medium heat. Add shallot and cook, stirring, 1 minute. Add squash and 1/3 tsp herbs and cook, stirring occasionally, until the squash starts to soften, 3 to 5 minutes. Add broth and salt; bring to a boil. Reduce heat to a simmer and cook until the squash is soft and mostly translucent, about 5 minutes more. Transfer to a blender and puree until smooth. Return the soup to the pan and stir in corn. Bring to a simmer over medium heat and cook, stirring occasionally, until the corn is tender, 3 to 5 minutes more. Remove from the heat; stir in lemon juice. Serve garnished with the remaining thyme and Parmesan cheese. In a large saucepan combine water, potato, carrot, celery, and onion. Bring to boiling; reduce heat. Simmer, covered, for 10 minutes. Do not drain.